Easy workability and gorgeous results. RETENTION+® and Perfect Color powders offer a wide spectrum of shades for enhancements that clients will love. Features superior adhesion, color stability and provides super strength and durability. Features superior workability in extensive color and coverage options. Use RETENTION+® and Perfect Color Powders with any CND® Sculpting Liquids for enhanced color options that clients will love. Sculpting powders in a wide spectrum of shades provide easy workability and gorgeous results! 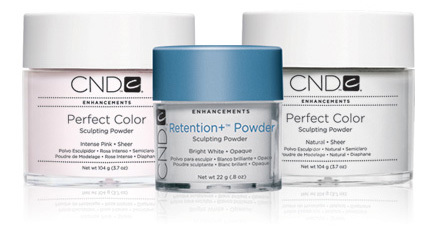 RETENTION+® Sculpting Powders come in three shades – clear, intense pink (sheer), and bright white (opaque). Each offers superior clarity and color stability. Perfect Color Powders have superior moldability in extensive color and coverage options. Choose from nine hues that can all be used with our award-winning sculpting liquids. Custom-blend colors to create unique enhancements that are perfectly suited to each and every client. Perfect Color Powders activate the cross-linking and polymerization of RETENTION+® and RADICAL SOLARNAIL® Sculpting Liquids. Liquid & Powder Kits offer comprehensive sets of products and tools for creating enhancements. Contact your CND® distributor to purchase.